Here's two simple electric motors that are easy to build. They are slight variations on the common spinning coil design. The first has the magnets spinning and uses the rotor as a switch to control the coil, the other has a reed switch which is activated by a small magnet spinning on a cardboard disc. Cut a piece of the 2mm copper wire about 150mm long, if it isn't straight, you can straighten the wire by twisting it an electric drill. Hold the other end with pliers and twist it in the drill, it should straighten it out. The magnet rotor is the part of the motor that spins, it's made from two neo-dymium magnets glued to the copper rod. Cut two small spacers about 15mm from the copper rod, these are to keep the magnets the right distance apart. Glue the long rod into the centre of one of the magnet, then glue the spacers either side. Apply a little extra glue and glue the other magnet in place. If the magnets end up off centre, you should be able to prise the two magnets apart using a knife, and reposition them. No need for extra glue, the attraction between the two magnets is very strong. With glue set, you can scrape the commutator sections. On one side of the magnets scrape all of the enamel off using a knife or sandpaper. On the other side, you only scrape half way around. The is so that the electro-magnet is only switched on when one face of the magnet is facing the coil. The coil is 80-100 turns of 28SWG wire, which I wound around a cardboard mandrel. Trace around the magnet onto the cardboard and cut this shape out. Cut two pieces of card about 75mm x 25mm (3"x1"). The round piece that you cut out first is glued into the centre of the two other pieces. When you've done that, you can wrap around 100 turns of the 28SWG copper magnet wire around the jig, to form your coil. After that, you can tear off the cardboard on one side, and cut around the coil on the other side. This is just so that it fits inside the bottle. If the wires are coming loose, apply some hot melt glue to the coil to keep it in place. Cut the bottle so that you have just the bottom 2" of it. Now glue the coil into the centre of the bottom of the bottle. Drill holes either side of the bottle, for the magnet rotor to rest in. They should be around 12mm (1/2" from the top of the bottle lid, or as close to the coil as you can get. The bearings should be loose! Rattly loose even. Take three pieces of insulated wire around 100mm (4") and strip the ends to bare copper. 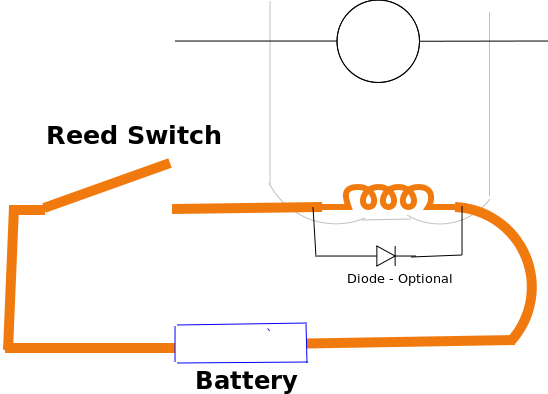 Skip the rest of this step, if you're building the reed switch motor. Two of the wires are taped to the plastic bottle so that the copper contacts the magnet rotor axle. The wire that touches the other end should only touch about half of the rotor axis. The other end of this wire goes straight to the battery. The other wire from the coil goes to the other battery terminal. It should run now if you give it a spin! You'll probably need to tweak the half contacting end until the motor runs. One of the wires wrapped around the axle. Mark out and cut out a cardboard disk about 4cm diameter . Then tape on your small magnet. Glue the bottle to the piece of cardboard. The position of the reed switch is important! It must be far enough away from the magnet rotor that the rotors magnetism doesn't trip the reed switch! You can check this by holding the reed switch down to the cardboard and slowly turning the magnet rotor - listen carefully for the reed switch clicking, it's very quiet, but you can hear it! When you're happy with the position of the reed switch, glue it in place. Step 9: Fit the cardboard timing disk and wiring it up! Push the cardboard timing disk onto the magnet rotor - it should be a tight fit (don't make a hole in it). The magnet should be positioned so that the coil is turned on when the magnet faces are parallel with the coil. The wiring is really simple - the switch and the coil are connected in series and this is connected to the battery.